This list displays my paintings that are available as paper or canvas prints. Click a letter to jump to a list of titles starting with that letter. Click on the title or image to see more information, or click on an available product to see purchase options. Basket Flowers are some of my favorites, easily mistaken for thistles, but take another look, they don’t have stickers, the flowers are about twice as large and the fragrance is very sweet. Basket Flowers line the Highways and Pastures of central Texas from May to July and sometimes form huge colonies. This old Case Tractor is in front of Joe Bland’s Tractor Sales in Valley Mills, Texas. Joe’s place provided me with the idea for my print “Junior’s” I thought an Iron Tractor belonged with Iron Weed which is the flower shown here that is a very showy late summer bloomer. This stone house is just north of Marble Falls and lots of folks stop to photograph it in the springtime when the Bluebonnets are blooming. I can't count the number of folks that have asked me if I have painted it so I finally did! This was inspired on my morning walk with my dogs! This sunlit road leads to the back of our house but I made a few changes. I painted our house from the front and changed our garage to a Barn. Coffee's on and a new day is in the making. Every morning is a great occasion, but those with misty ground fog are especially inspiring as the light seems to awaken the sleeping landscape in slow motion. This title is the result of my annual contest to name one of my Paintings. 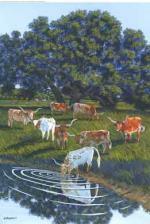 This scene was inspired out at our Ranch by the Longhorn Drinking at the Edge of our Stock Tank and I added the others and cleaned up the background a little! This is Neal's Creek which marks the back property line of our Bosque County ranch. We frequently walk along the creek and are always inspired by the ever changing streambed and the wild life that depend on its waters. At a time when most people would be watching the threatening sky, I saw shadows weaving a web around a barn. The Road and Butte are west of Rock springs, Texas and the old Ford Truck and Tree were between Kerrville and Vanderpool, Texas and They all seemed to go together. This is one of the Ferries at Port Aransas and I was riding back and forth trying to photograph the Dolphins that always follow the Ferry.As I was watching the Fins rise in the water, I suddenly got the idea to load the Ferry with 50's cars showing their fins. I was wondering if I could work old cars into a Seacoast Calendar! I was waiting at the Goose Island State Park Boat Landing for Chuck Naiser to arrive with his boat to go looking for Whooping Cranes. At first light II watched these White Pelicans fly closer and closer until they landed in the water right in front of me. I wondered if the one going in a different direction from the others was the leader or just a non conformist! 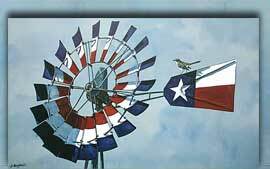 This painting was inspired right out my back door here at the Ranch after one of our Spring Storms. I made up everything else in this picture except the sky! A rainbow is one of those spectacular things in nature that even the worst grouch in the world has to admit to enjoying. I've seen a lot of rainbows and the brightest are always in late afternoon! This Title is the result of my 2009 Contest to Name this Painting and the winning title was submitted by Carolyn Barnett of Wimberly, Texas! I found this grove of live oaks just off of State Highway 123 north of Czestochowa, Texas complete with the Cattle which I changed to White Faced Herefords for more visibility. I added the Bluebonnets, Cactus and little red roofed house! I was driving down the highway when I happened to glance to the side and see a couple of farmers on their modern tractors talking over the fence. I thought this had some potential so I recomposed the scene using a couple of antique tractors that I saw at the Hamilton Antique Tractor Pull. For those of you who arent into Antique Tractors the Rivalry between the fans of John Deere (Green Tractor) and Farmall (Red Tractor) is sometimes quite intense. So if these two guys with their extreme differences of opinion can be friends, why can't those Muslims and Jews get along? The Albany Ice Company is in Albany, Texas and has been in the same family since it was built in the 1920's. No Ice but a standing memorial to a time before home refrigerators when every town had an Ice Company! The Albany Ice Co. is on the Historic Bankhead Highway (first paved road across America!) which will be the theme of my 2015 Calendar. Texas has more miles of the Bankhead Highway than any other state and much of it is still drive able! It's common to see old cars and trucks out in the field sitting where they last broke down. They will have it hauled off one of these days when there is nothing more important to do! This house is near Coleman, Texas! This was inspired in the Big Thicket at sunrise between Livingston and Huntsville and the first thing to attract my attention was this Egret taking off. As he rose up he turned and flew straight into the sunrise and I knew it was going to be another great day!